Offers a perfect setting for a fantastic and memorable holiday. Room Service (Additional Fees) Please Note: Room Service Is Not Included in This Room Type. If You Wish to Have Room Service Between the Hours of 8:00 A.M. Through 11:00 P.M. You May Upgrade to the next Available Room Category or Book This Room and Pay a Daily Surcharge at Check-in. Room Amenities: 532 sq ft. 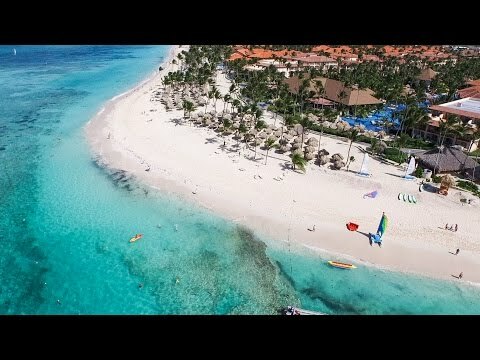 Located in Arena Gorda (Playa Bavaro) next to Macao and 15 miles (25 kilometers) away from the Punta Cana International Airport, 30 miles (48 kilometers) from La Romana International Airport and 90 miles (144 kilometers) from Santo Domingos International Airport Las Americas. The Historic City of Santo Domingo can be easily reached by road. Welcome to the Majestic Colonial, a 4-star upscale beachfront resort! This beautiful beachfront resort offers luxury accommodations and facilities. The perfect resort for couples, families and groups to relax, let loose and have a good time. The resort features an adults-only section, the Colonial Club (find more details below) for those 18 and older. Please Note: There are no exchange privileges between Majestic Elegance and Majestic Colonial, whichever you choose - this will be the perfect setting for a fantastic and memorable vacation. The Majestic Colonial is the perfect setting for a fantastic and memorable holiday. Boasting 658 Junior Suites, some with indoor Jacuzzis, some with outdoor Jacuzzis as well as some rooms with direct access to the pool. Choose from seven restaurants. Enjoy a refreshing cocktail at any of the 14 bars including a swim-up bar. Kids club which is called the Splash Club offers a wide variety of entertainment for kids. Their highly trained staff will take care of the small ones needs, making this a special and unforgettable vacation. Clients must have been married within one month of arrival and present a copy of their wedding certificate at check-in (a remark must be placed on your reservation prior to arrival). Try your luck at the on-site casino or pamper yourself with a spa treatment (additional fees may apply) and enjoy a refreshing cocktail at any of the 11 bars including a swim-up bar. The Majestic Colonial offers a complimentary golf special with your stay (more details below), a honeymoon package for newlyweds and so much more. Enjoy live music at the plaza bar and lobby bar, take a dip in the 1312 feet (400 meter) swimming pool, or relax in the two Jacuzzis integrated into the swimming pool. There are babysitting services as well as a supervised children`s club. Enjoy various sports including tennis, basketball, ping-pong, pool, mini football, frenchballs and darts. The resort also offers daily and nightly entertainment as well as water sports. There`s something for everyone in the family to enjoy! There are several natural parks for outdoor lovers such as Los Haitises (near Samana) and several semi-deserted islands like Saona Island or Catalina Island (near La Romana). If you`re interested in a mix of native culture, you will love Altos de Chavon in La Romana and of course the City of Santo Domingo. Also located within the area of Punta Cana you may find such attractions as Manati Park and Dolphin Island. There are diverse options of nighttime entertainment and a large selection of tours and excursions including several golf courses in the area.